Have a great Christmas everyone! We get to give you news and play a Christmas song at the same time! RUN-D.M.C. apparently changed the course of music in the '80s, bringing the old-school of rap into the new with one simple piece of flat, black plastic. Coming up in the rap world of the early-1980s under the wing of Kurtis Blow (group manager Russell Simmons managed Blow, and Run was, at one time, a DJ known as "Son of Kurtis Blow") and Blow's bassist and burgeoning super-producer Larry Smith, the trio - Joseph "Run" Simmons, Darryl "D.M.C." McDaniels and Jason "Jam Master Jay" Mizell - learned from the best, but created their own path. 1983 was the year that they first broke out. With only an Oberheim DMX drum program and some cuts by Jay, ‘Sucker M.C.s (Krush-Groove 1)’ was a shot across the bow to the slick, post-disco pocket rap had settled into. It was raw, pure swagger and it took both New Yorkers and music aficionados around the world by storm. The song's lyrics are a mandatory memorisation assignment to this day by MCs learning their craft. 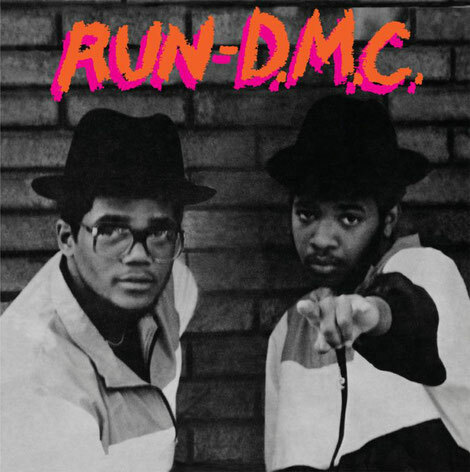 "Two years ago, a friend of mine..."
The group's sound, which was laid out muscularly on Run-D.M.C., had a harder approach than their peers, thanks to producer Larry Smith's use of live musicians who laid down grooves but didn't soften the edges. Lyrically the group wasn't just about brags either, with songs like ‘Hard Times’, ‘It's Like That’ and ‘Wake Up’ (the first two were singles). Run's and D.M.C. 's overlapping tag-team approach to lyricism was apparently powerful and immensely influential. ‘Rock Box’, another single and arguably the centrepiece of the album, was a nod to their hard edge, and a foreshadowing of their first worldwide smash, 1985's ‘King Of Rock’. Jam Master Jay's DJ work was stellar, knowing exactly when to jump in and put listeners' ears in a headlock. The album was the first rap full-length to achieve Gold status, and as fans know, the group was just getting started - their next two LPs would take them to even higher status in the music world, critically and sales-wise. But this is where it all started, and it's a classic that still sounds fresh today as it did more than 30 years ago. It’s out 20 January 2017 on Get On Down.